Where would we be without the invention of the wheel? The innovative design has brought us transport, machinery and now rolling whiteboards! 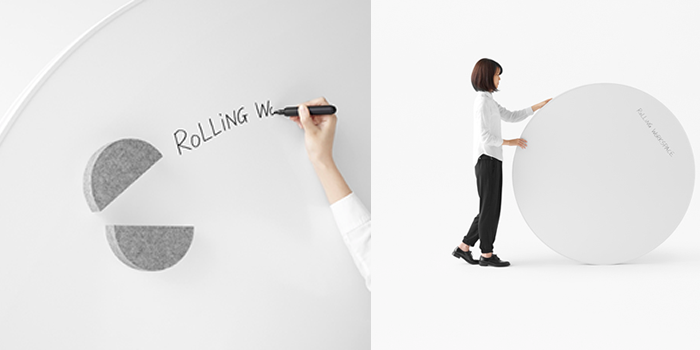 Displayed at Orgatec 2016, “Nendo” displayed their “Space” rolling boards range for Japanese manufacturer KOKUYO. The inspiration behind creating a circular shape for the generic whiteboard was to “encourage creativity”. The round shape also means that they are easily moved around. Voiding any awkward and heavy lifting also reduces stress levels within the office space. Board users are also encouraged to write in a “radial way, taking away the linear concept that we often find ourselves in within an office environment”, adding to the creativity that these boards impose. During the Orgatec exhibition, Nendo created a full office suite, including single and bench desks, soft seating and high counters. Each furniture piece included “slots” where the rolling boards could be fixed into, therefore creating a board that has a practical as well as a stylish divider. The desks and high counters also included side slots where bicycles could be stored. Ideal for employees who commute to work by bike, having the opportunity to store their cycle securely into their workstation. The wheels would then reflect the rolling board shape, becoming part of the décor, continuing the free flowing atmosphere. 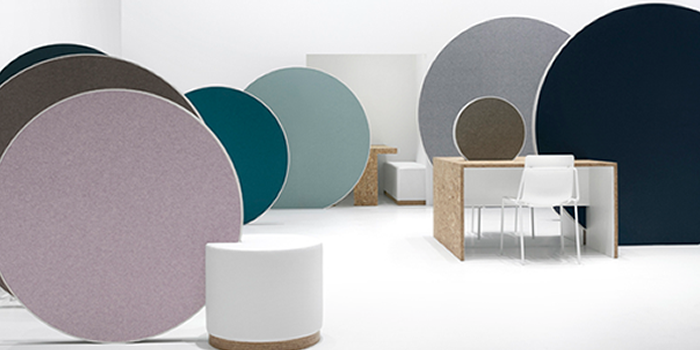 Sound absorbing fabric is placed on the other side of the whiteboard, thus adding acoustic properties. The colourful fabrics add a splash of brightness within the office, colours can also be mentally stimulating, emphasising the creative effects they produce. 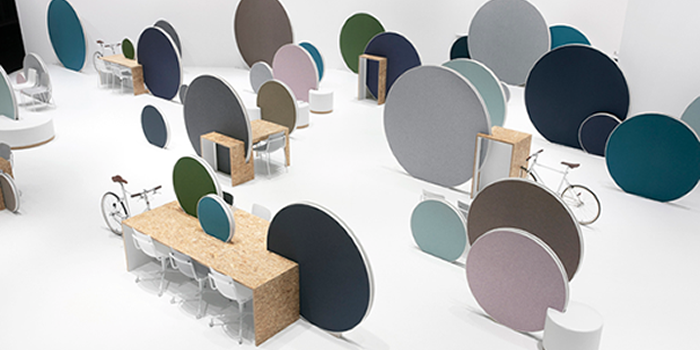 The discs then become a fashionable, practical feature that not only creates a friendly, soothing environment, but also one that allows for the creative mind to work at its full potential. The boards are also available in a variety of sizes, allowing them to be adapted to different parts of the office. For example, the smaller boards can be placed between bench desks, creating some privacy and the larger ones can be placed within soft seating modules to create a room divider. 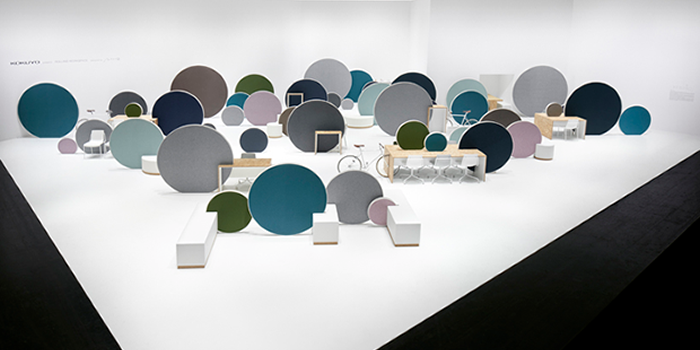 Having so many different rounded shapes around the room creates a setting that is similar to a solar system or universe, reflecting the title of the range: “Space”. “Nendo” has created an office accessory that is not only visually stunning, but also extremely practical. The design creates acoustic benefits, allows for easy transportation and helps creative thinking amongst the team. The range is also great for anybody (like myself) who struggle to write in a straight line!